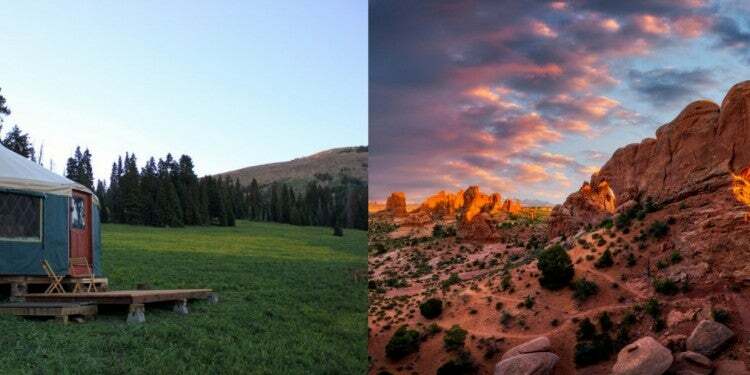 Home to over 60 million acres of public land (with 990,600 recently added with the passage of the Natural Resources Management Act), Utah offers arid deserts, high mountain ranges, and acres of flat meadows that can feel unexplored if you know where to look. 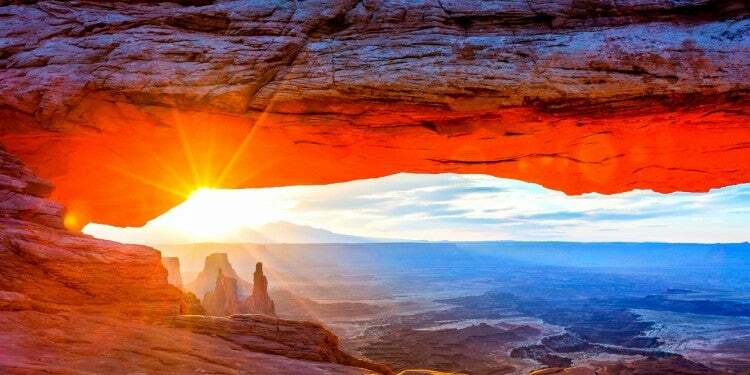 The “Mighty 5” are Utah’s five national parks (Zion, Bryce, Arches, Canyonlands, and Capitol Reef) and each one is stunning and surreal its own way. But the long lines at the entrance will leave you feeling anything but solitary. These five destinations tend to be very crowded with campgrounds booking months in advance. 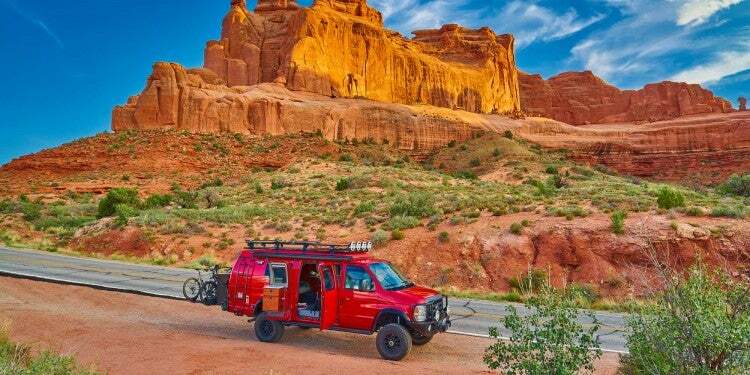 Despite the popularity of Utah hot spots, it’s a vast state with plenty of room to explore. Consider skipping the mighty five for a little more variety and far fewer people. These eight often overlooked destinations in Utah are just the beginning. Beyond the iconic Utah destinations, you’ll find some of the state’s most cherished natural areas, man-made wonders, and exciting activities. Whether they are oft-overlooked or simply unknown, you’ll be able to find sites that elicit wonder. Among these are Native American artifacts, geologic behemoths, and forgotten forests. 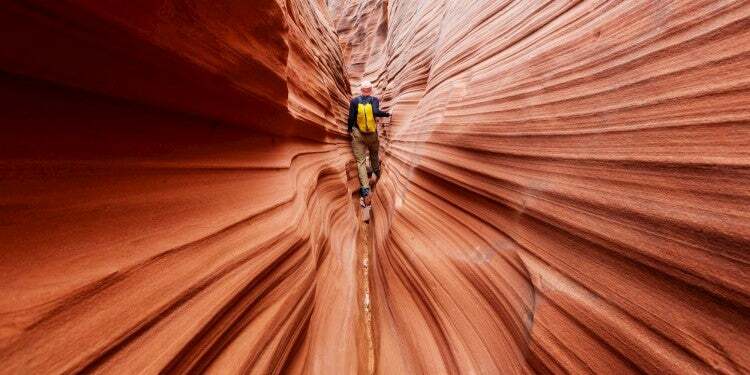 Here are eight Utah destinations that will take you to great spots off-the-beaten-path. You wouldn’t know about the Little Grand Canyon until you actually, legitimately stumbled upon it after navigating miles of deserted dirt roads. But once you reach the rim of the canyon, you’ll be sure you’ve found it. The area is aptly-named, featuring gorgeous striated rock walls and curving, craggy cliffs. Though the rim doesn’t offer a dramatic drop, the hillside rolls down to a significant cliff, which meets the river bed and valley below. If you’re looking for a family vacation spot without the lengthy drive from Salt Lake City, this might be your destination. Follow GPS coordinates, 39.092990, -110.758941, to the Little Grand Canyon. You’ll turn down a series of County Roads which can also take you to Buckhorn Wash for a concentrated display of petroglyphs. Camp Near Utah’s Little Grand Canyon: There are three recommended campsites near The Little Grand Canyon: Wedge Overlook, Buckhorn Draw Dispersed, and San Rafael Bridge Campground. Each offers primitive camp options and solitude. From the San Rafael Bridge you can access a hike through the canyon, and from Wedge Overlook you’ll find stunning views of the canyon. 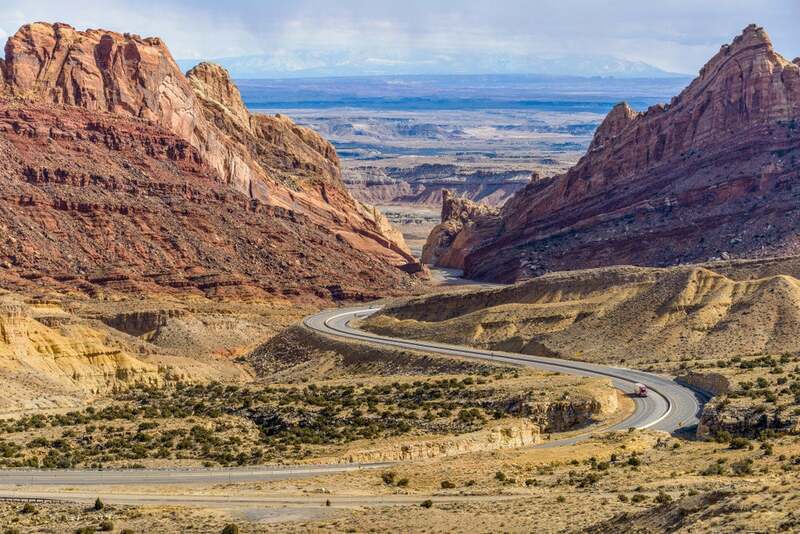 Situated on the northwestern perimeter of Utah, the Silver Island Mountain Backcountry Byway is less of a destination and more of an experience in Utah. 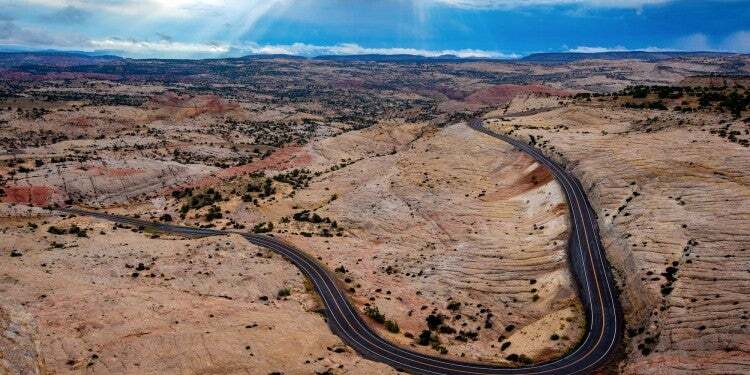 Comprised of a 54-mile scenic loop through limestone sediment mountains adjacent to the famous Bonneville Salt Flats, a trip through this byway will present one of Utah’s less-explored expanses. Adventure-seekers are drawn to the salt flats each year to break land-speed records or capture mirror-like photos after light rain in early fall. Many drive right by Silver Island on their way into Nevada–the stretch of road leading up to it is long and lonely, flat on either side. But Silver Island is a gateway to rugged adventure. Eight peaks over 6,000’ are accessible and primitive camping in vehicles is allowed just 100’ from the road. Camping near Silver Island Mountain Backcountry Byway: In terms of primitive camping, this area has been off the map for a while making it secluded and tranquil. Established camping can be found at the Wendover KOA, about 10 miles from the Byway. “This KOA campground would be great for RV users who want to visit the Casinos on the Nevada side of the NV/UT border, and for those spending time at the Bonneville Salt Flats for races or recreational fun.” –The Dyrt camper Amanda M.
While many of these Utah destinations are natural wonders, the “Tree of Utah” is a man-made roadside attraction sure to make you stop the car. 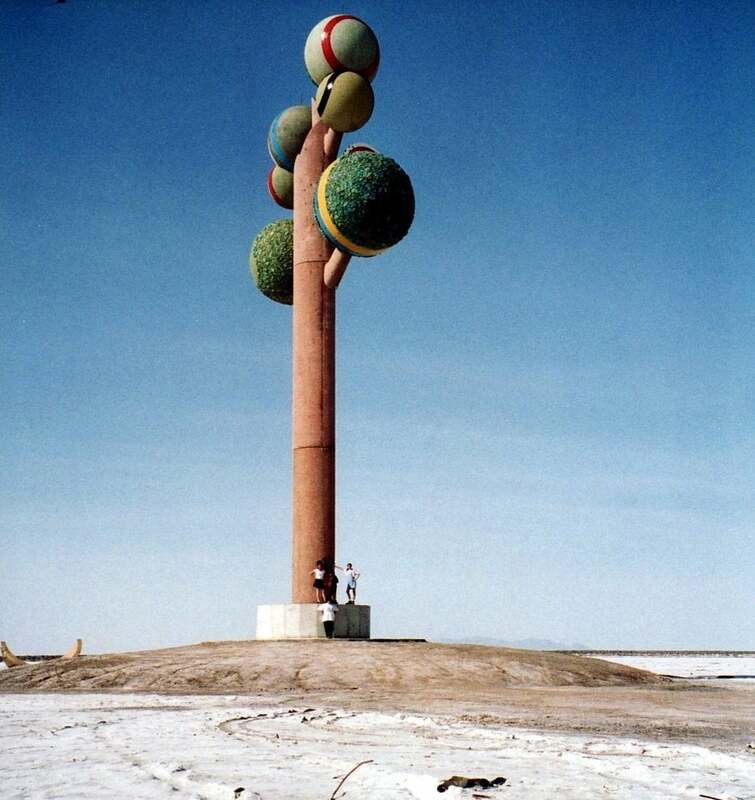 This 90-foot-tall oddity stands lonely in the desert, and can actually be seen on the drive to Silver Island. The massive spire is a work of art created by Swedish artist Karl Momen, who contrasts ann acid-trip art style with the dry landscape of the Bonneville salt flats. For years, the stark contrast between art and desert expanse has perplexed locals and tourists alike. Beneath the statue, an inscription recites the lines of Friedrich Schiller’s Ode to Joy. While you can’t stop directly on the roadside to admire the eccentric installation, you can take exit four and turn left on to the frontage road, which will take you back to the Tree of Utah. Camping near the Tree of Life: Camping around this work of art is similar to finding camping on the Silver Island Mountain Byway—it’s mostly primitive, but very free and worth the effort. Staying the night around the salt flats gives you a perspective on nature you may not have experienced before. 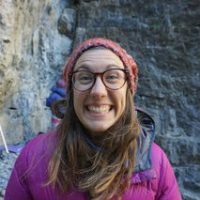 Utah’s portion of the Sawtooth National Forest remains a mystery for many Utah residents; since the majority of the woods are located in Idaho, many might think that Utah’s four percent of the forest isn’t worth it. This overlooked paradise is perfectly hidden enough for you to enjoy solitude year-round. This district encompasses the Raft River Mountain Range—with peaks up to 10,300 feet for hiking, climbing and more. There is one available campground, Clear Creek Campground, and two main hiking trails–Bull Flat Trail and Lake Fork Trail. This region is well-suited with hunters and anglers for the varied terrain including meadows and streams, and while the hike to the top of Bull Mountain can include bushwacking, the cirque and views are worth the tricky terrain. Camping in Sawtooth National Forest: The main campground in the area is Clear Creek Campground which is open seasonally and offers campers the choice of 12 free campsites. Typically, if you visit on a weekday you’ll have the entire campground to yourself. There are options for anglers, hikers, equestrians, and hammock-hangers. “For most of the year this campground is sparsely populated so it’s a nice place for solitude. There is also a large ~200′ cirque at the end of a 3-mile hike that continues onto the high point of the range and of Box Elder County!” –The Dyrt camper Alan B. A favorite destination for anglers, Strawberry Reservoir is stocked with rainbow, cutthroat, and kokanee salmon, and hosts a natural population of around 60 percent as well. In fact, anglers consistently catch fish in the 24-inch range, and the heftiest cutthroat caught on record weighed 27 pounds back in 1930. The summertime sunsets over the lake are stunning, with sherbert hues reflecting across the surface. In the summer months, it’s recommended to float away from the shoreline and cast your bait from an inner tube. Ice fishers will be happy to know that fishing is available year-round. 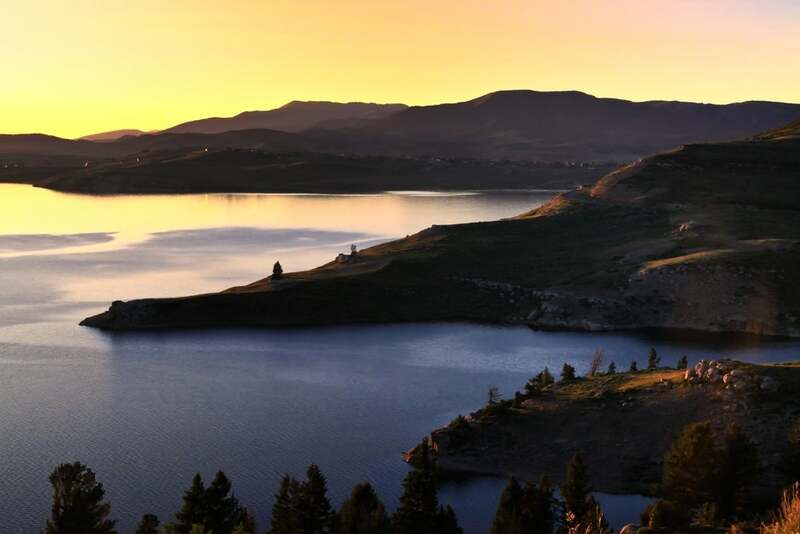 Camping near Strawberry Reservoir: Between Strawberry Bay, Soldier Creek, and Aspen Grove, there are more than 500 established campsites at Strawberry Reservoir. Despite that large number, many sites can get booked up throughout the summer, so be sure to make your reservation ahead of time. Each campground offers access to the reservoir and the surrounding forest and meadows. You might be wondering, “what the heck is a Trilobite?” Dating back 550 million years, Trilobites are a form of invertebrate marine life that lived primarily along the seafloor. After centuries underground, Trilobites have become incredibly well-preserved fossils—and tend to be very popular among collectors. They’re found in limestone shale, often dug out in mines, and have become unique Utah destinations for the history-curious. The Trilotebite Quarry, just outside Delta, Utah, offers collectors and tourists a destination for days of searching. In the past, collectors have found trilobites worth up to $2,000. Camping near Trilobite Quarry: The nearest established campground to the Trilobite Quarry is about an hour east at Oak Creek Campground. However, the Quarry is surrounded by BLM land, so campers can pull off before or after the Quarry to camp. Just remember, you can only stay in the same campsite for 14 days. Geology in this state can be mind blowing, but few Utah destinations can measure up to central Utah’s Parowan Gap. 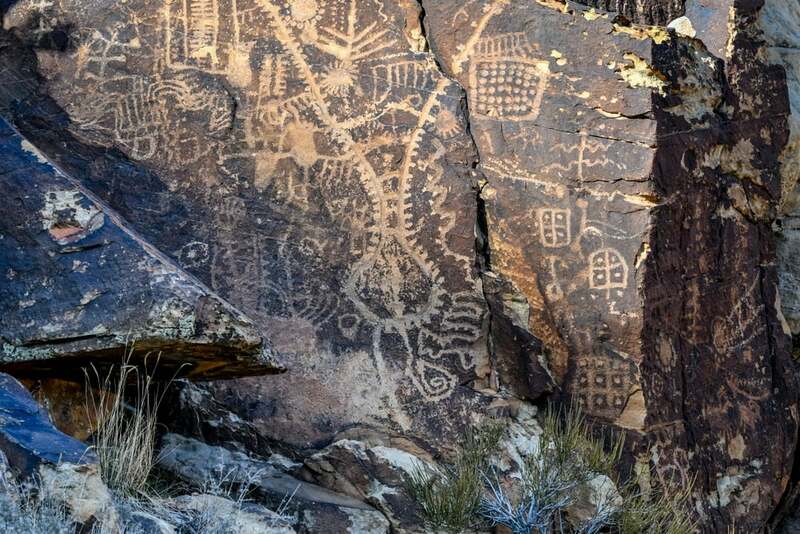 Set 15 minutes west of Interstate 15, Parowan preserves a substantial amount of petroglyphs among the eroded wind-gap of the Red Mountains. Unlike other petroglyphs in Buckhorn Wash or Nine Mile Canyon, the glyphs here are geometric in shape. The most notable is the Zipper glyph, which archeologists believe uses time and space to capture the changing of the seasons. On either equinox, hundreds gather to watch The Overseer, a face-shaped rock on the eastern edge of the gap, swallow the sun through the slit of his mouth. Cairns mark the general location to stand for the best view. Camping near Parowan Gap: Parowan is surrounded by BLM land and there are multiple dirt roads with camping access off of Gap Road. If you’ve ever been curious about free camping on Utah’s BLM land, camping near Parowan Gap is an exciting place to start. 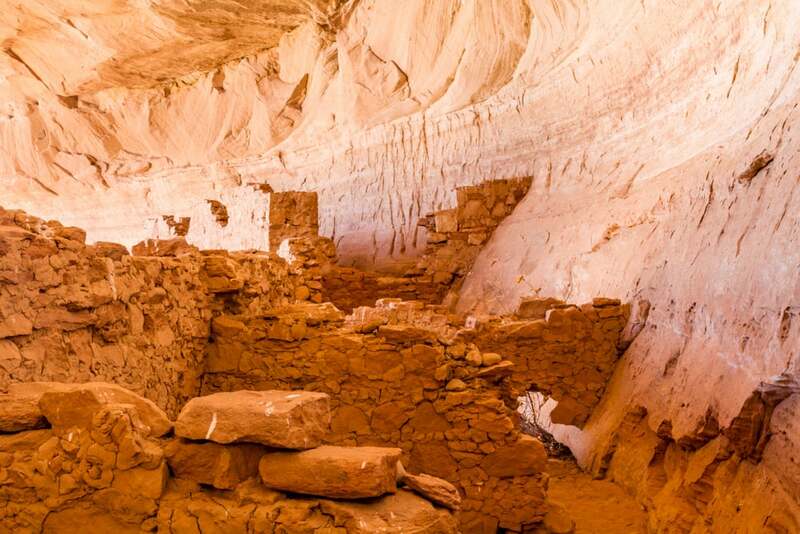 Ancient remnants can be found at many Utah destinations, but the 17 Room Ruin might be the best one to take you back to the year 1,200, offer a more vivid portrait of what life looked like then. Built back into a sandstone cliff, the 17 Room Ruin consists of 14-18 rooms from the ancient Puebloans who accessed their dwellings from a rooftop doorway. Beneath the ruins, Utah’s Green River flows across a grassy valley where river rafters can see the remains of an ancient bridge which washed away in 2007 and has yet to be repaired. Camping near 17 Room Ruin: 17 Room Ruin is one of many less-explored Utah destinations set in the desert, meaningvthere’s plenty of BLM land to camp on if you’d like to go primitive. If an established campground is more your speed, the nearby Sand Island Campground offers 25 first-come, first-served campsites along the San Juan River that are shaded with cottonwood trees and in close proximity to two full panels of petroglyphs. “A simple campground (there’s water and a vault toilet) with lovely views. It was almost empty when we were there in June. No reservations, no caretakers, so get ready to feel like you’re in the middle of nowhere (in a good way).” –The Dyrt camper Amber A.